This dining area received a polishable overlay which was sawcut, polished, and dyed. Diagonal sawcuts create a rich look in the kitchen area. 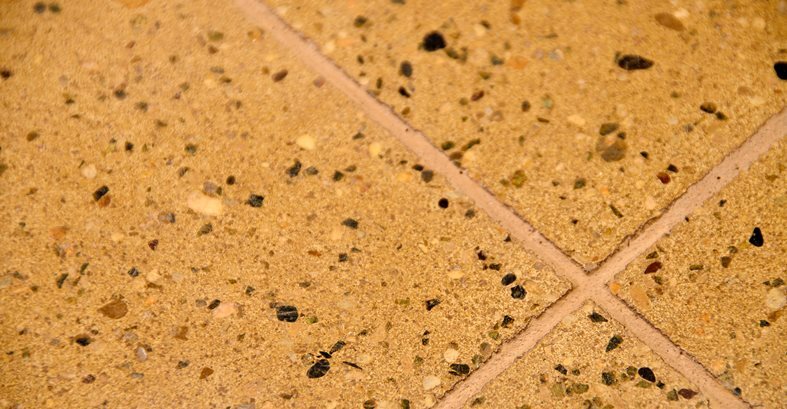 This close-up shows the polishable overlay seeded and polished to look like ground concrete, not terrazzo. 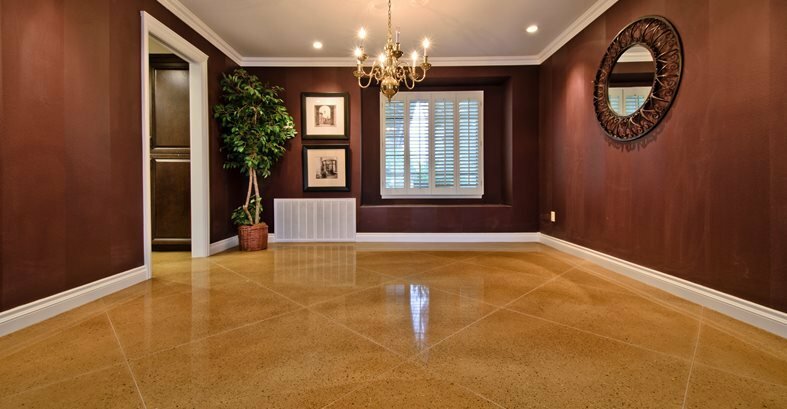 Polished concrete has to be at the top of the popularity list of decorative concrete applications the last few years and it is still growing fiercely. This year at the World of Concrete it seemed that every other booth was selling polishing equipment in an effort to serve this booming market. The majority of concrete slabs can be polished as can most existing slabs. Existing slabs often have imperfections such as tile grout lines, patch marks from framing braces or carpet tack strips, or even larger areas of the slab that have that have been torn out and replaced in making major plumbing repairs. Some customers like leaving the slab that way and polishing the concrete. It’s the look they are going for and it fits with a variety of design themes such as a skate shop, a hip clothing store, or the local fish taco eatery, for instance. I recently spoke with Johnson about this option while he was putting the finishing touches on a project in Redlands, Calif. His company, ACI Flooring Inc, has been in business since 2003 and focuses on concrete flooring treatments such as polished overlays, microtoppings, stains, stampable overlays, and industrial epoxies. His special process includes seeding the overlay then polishing to expose the aggregate. This creates the same look as though the original aggregate in the concrete was being exposed. 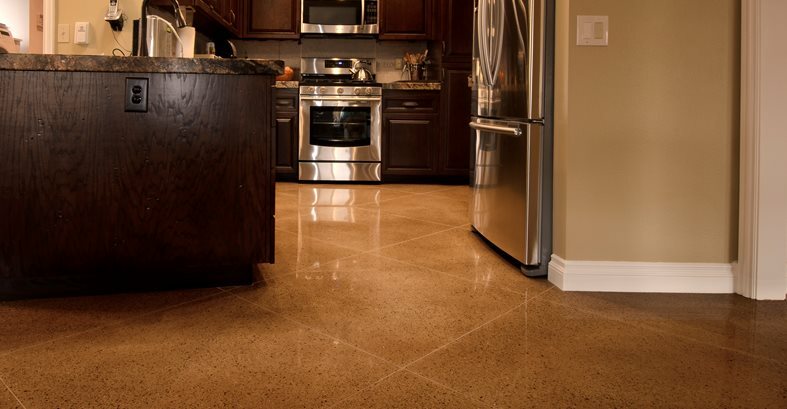 The look can be very close to how terrazzo looks. “We don’t try to seed the overlay to make it look like terrazzo, we want it to look like ground concrete, yet this process can be offered as a terrazzo alternative at about half the price.” says Johnson.